APA partnered with the National Renewable Energy Laboratory, Clarion Associates, and the American Wind Energy Association to produce Planning for Wind Energy with funding from the Department of Energy. The report was developed under the auspices of the Green Communities Research Center, one of APA's National Centers for Planning. It supports the aim of "20% Wind by 2030" by providing planners with the tools and strategies they need to help plan for, open, and responsibly develop wind energy markets. This report is intended to help community planners effect policy and regulatory change, build stakeholder support, and provide key technical information to public officials. Recognizing the environmental and economic benefits of clean, domestic energy production, communities across the country want to take advantage of wind energy. This new report gives planners the tools they need to help strengthen local wind energy policies. It describes the benefits, debunks the myths, and provides point-by-point checklists for incorporating wind energy into planning and zoning. As part of the first phase of this project, APA developed a survey to assess the current state of wind energy planning in communities across the country, discover what challenges planners are facing in planning for regulating and implementing wind energy facilities, and ask what information or resources would be most helpful to them in planning for wind energy. In 2008, the U.S. Department of Energy issued 20 percent Wind Energy by 2030: Increasing Wind Energy's Contribution to U.S. Electricity Supply, a report examining the feasibility of using wind energy to provide 20 percent of U.S. electricity needs by 2030. The report found that the U.S. has the capability to achieve this goal, but that challenges and barriers must be overcome. These include developing transmission infrastructure, streamlining siting and permitting procedures, and increasing wind turbine installations. Planners are well-suited and well-placed to address these issues at the local level within their communities by helping to create policies and regulations that allow for appropriate wind energy development. Policies and regulations may include proper safety and siting standards and address existing barriers to renewable energy. The American Planning Association (APA), in partnership with the National Renewable Energy Laboratory, Clarion Associates, and the American Wind Energy Association, and with funding from DOE, is working to produce a guidebook on community planning strategies for successful wind energy implementation. As part of the first phase of this project, APA developed a survey to assess the current state of wind energy planning in communities across the country, discover what challenges planners are facing in planning for, regulating, and implementing wind energy facilities, and ask what information or resources would be most helpful to them in planning for wind energy. The APA survey was conducted online using Zoomerang. It was targeted at planners who are grappling with the issue of wind energy planning in their work or communities, and was intended as an information-gathering tool to inform the development of the final guidebook. APA launched the survey on July 2, 2010, and announced the launch to APA's approximately 40,000 members in the July 6 edition of APA Interact, APA's bimonthly e-newsletter. An invitation to take the survey was also posted on the main page of the APA website, as well as the project page, and was emailed to 61 planners who had attended the Planning for Wind Energy facilitated discussion session at the 2010 APA National Planning Conference. The survey will remain open throughout the project duration as a way to continue gathering input from planners on this topic. Over four-fifths of respondents reported positive attitudes toward wind energy, though some expressed reservations about potential negative impacts of this technology and the complexity of the issues involved. Three-fifths of respondents estimated that public opinion toward wind energy in their communities was more positive than negative, though not overwhelmingly so. Over two-thirds of respondents had worked on a wind energy ordinance; over half reported that their communities had drafted ordinances, with just under one-quarter of respondents reporting visioning and plan-writing involving wind energy issues. Planners are the local government staff most likely to be engaged in wind energy issues. Over two-thirds of respondents reported working with small wind compared to just under half working with large wind. Similarly, four-fifths had an interest in small wind versus just over half reporting an interest in large wind. Only one-third of respondents reported addressing community wind in their communities, but almost two-thirds wanted more information on this topic. Size thresholds for small wind energy systems varied from 10 to 100 kW, and a few communities have added a "micro" wind category for systems under 5 kW. Setback requirements, height limits, and noise thresholds are common ordinance provisions for small and community wind energy systems. Large wind ordinances also commonly include abandonment clauses and require environmental review. More respondents (50 percent) reported small wind energy projects in their communities than large wind (24 percent) or community wind (14 percent). One-third of respondents have yet to see wind energy turbines installed in their communities. Respondents found that having a good ordinance in place and education and outreach efforts to the public were important in successfully implementing wind energy systems. Respondents' top five most commonly identified challenges were scenic/aesthetic impacts, noise impacts, height restrictions, wildlife impacts, and property value issues. Public concerns and a lack of information about wind energy systems were also mentioned. 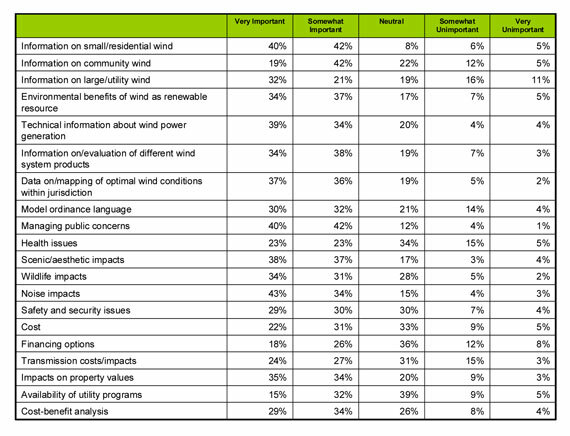 Respondents' most commonly identified issues of importance were information on small wind, managing public concerns, noise impacts, scenic and aesthetic impacts, technical information about wind power generation, and mapping of optimal wind conditions within a jurisdiction. Respondents feel that there is a lack of good information and helpful resources available; they requested model and sample ordinance language, case studies, and information on potential impacts of wind turbines. A more detailed description of the questions we asked and the results we received follows below. To begin, we asked respondents to tell us some information about themselves to gain a better sense of the contexts in which they are addressing wind energy issues. Of the 180 survey responses received through September 15, 2010, 135 (84 percent) identified themselves as APA members, and 91 (57 percent) were AICP-certified planners. The majority of respondents (87 percent) were public-sector planners, with 10 percent from the private sector, 2 percent from academia, 1 percent from nonprofits, and 6 percent from other sectors, including the federal government (respondents could select more than one response to this question). All but the following eight states were represented by the respondents: Alabama, Arizona, Kansas, Kentucky, Montana, New Hampshire, North Dakota, and West Virginia. Additionally, a few responses came from outside the United States. Just under half of the respondents (43 percent) work in both rural and urban contexts, with 27 percent working in only an urban context and 27 percent working only in a rural setting. More than half of respondents work with small or medium-sized municipalities (29 and 27 percent, respectively), 40 percent work at the county level, and around 10 percent each work in the contexts of large cities (100,000+ population), regions, and federal government (respondents could select more than one category). We asked respondents to tell us how they and their communities viewed wind energy. Respondents reported largely positive attitudes toward wind energy (85 percent versus 12 percent neutral and 4 percent negative), with 41 percent indicating a "very positive" attitude. We then asked respondents about their experiences with wind energy. Just over half reported positive experiences, with only 11 percent reporting a "very positive" experience. "Neutral" responses were 28 percent, and negative responses were 17 percent (4 percent reported a "very negative" experience). See Figure 1. When invited to comment upon what had influenced their experiences with wind energy, respondents referenced a general interest in environmental or sustainability issues as the basis for their opinions on wind energy; concerns about climate change, energy independence and sustainability were common responses to this question. Some respondents mentioned research performed by other agencies such as the American Planning Association or the American Wind Energy Association, as well as their personal research on wind energy. 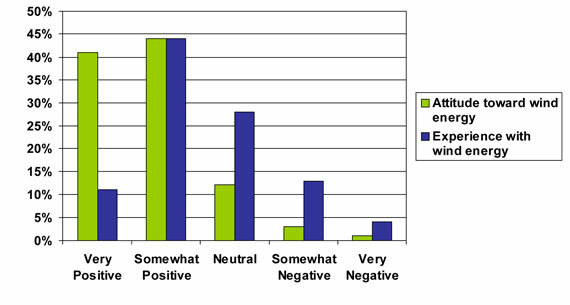 Public interest in, demand for, or resistance to alternative energy was a factor for some respondents. Other responses to this question included potential cost savings associated with wind energy, awareness of communities with successful wind energy projects, concerns about the objectivity of information available from wind energy proponents, and improvements in wind energy technology. When asked to estimate levels of public interest in wind energy within their communities, respondents reported moderate (34 percent) to high (42 percent, with 18 percent reporting "very high") interest levels; one-quarter reported somewhat to very low interest. We then asked respondents to estimate the percentage of public opinion for versus against wind energy in their community. Over half (60 percent) of responses reported more community support than opposition, 20 percent reported attitudes at 50-50, and 15 percent reported more opposition than support. Of the responses showing a majority of community support, over half were in the 60 to 70 percent support range. To assess the current state of wind energy planning, we asked respondents several questions about the types of wind energy planning activities with which they have been involved. Ordinance writing was the most common activity of respondents, followed by research and data collection. See Table 1 below. We also asked respondents to tell us how their communities had addressed wind energy planning. 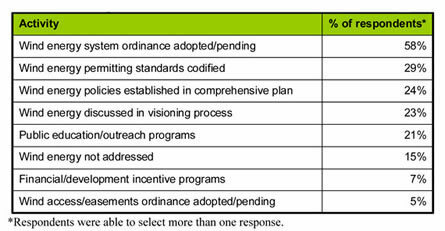 The most common responses (see Table 2) were adoption or development of wind energy ordinances and codification of wind energy permitting standards. Other communities addressed wind energy in their visioning processes, established comprehensive plan policies on this topic), or conducted public outreach and education programs. Only a handful of respondents indicated that their communities were working on financial or development incentives or wind access easement issues. 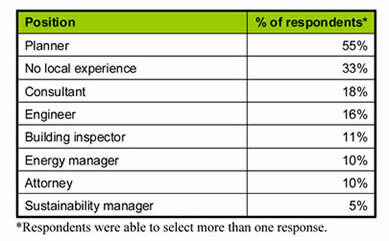 Finally, we asked where wind energy expertise lay within local government staff (see Table 3), and the majority of respondents reported that planners fit this role. One-third of respondents reported that no local government staff has wind energy expertise. Consultants were used as local wind energy experts for 18 percent of respondents, with others noting the roles of engineers, building inspectors, attorneys, and energy or sustainability managers. We asked respondents to tell us about what types of wind energy systems were being implemented within their communities (see Figure 2). 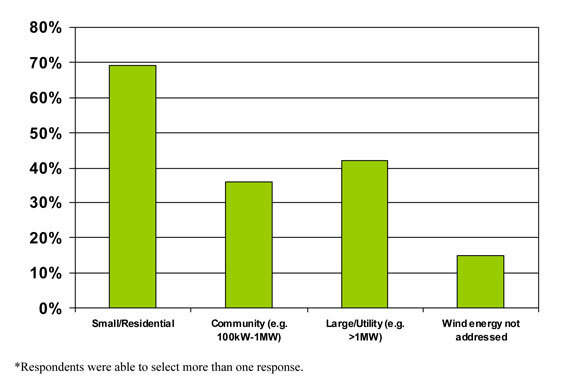 Most communities categorize wind energy systems based on generating capacity of a turbine or wind energy project, and we used common size thresholds of less than 100 kW for small/residential wind, 100 kW to 1 MW for community wind, and greater than 1 MW for large or utility scale wind. Most respondents (69 percent) reported small-scale wind being addressed in their community; less than half (42 percent) were working with large wind, and just over one-third (36 percent) reported local community wind systems. For 15 percent of respondents, wind energy systems were not being addressed. Because there is a wide range of definitions given for different scales of wind energy, however, we also asked respondents to tell us if their size thresholds or definitions differed from those we provided. A number of respondents reported that their ordinances set a lower threshold for "small" wind energy systems; these numbers ranged from 10 to 25 kW, with 25 kW being a fairly common choice. In addition, several respondents included a category of "micro" or "mini" wind energy systems, or systems with a generating capacity of 10 kW or less. Other methods for differentiating between different system types included those based on turbine height or whether the energy generated by the system will be used onsite or sold to other users. 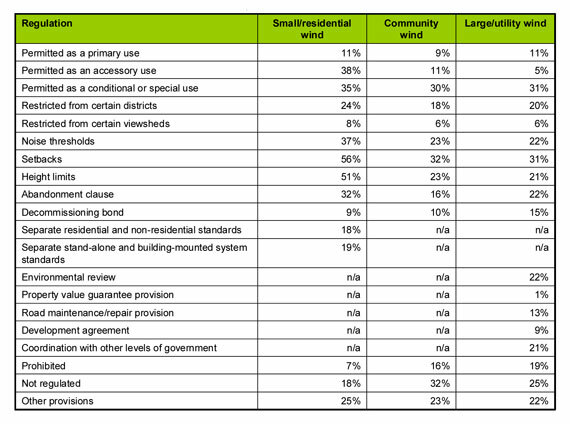 To further assess the current state of wind energy planning, we asked questions relating to the content of local ordinances regulating small, community, and large-scale wind energy systems (see Table 4). It was unclear, however, whether a lack of response meant that the community's ordinance did not include that provision, or whether the community did not regulate that wind energy system scale at all. For small wind energy systems, the five most commonly cited provisions in use by respondents' communities were setbacks (56 percent), height limits (51 percent), permitting small wind energy systems as an accessory use (38 percent), noise thresholds (37 percent), and permitting small wind energy systems as a conditional or special use (35 percent). Eighteen percent of respondents said small wind was not regulated in their communities. For community wind, the five most commonly cited provisions in use by respondents' communities were setbacks (32 percent), permitting community wind as a conditional or special use (30 percent), noise thresholds (23 percent), height limits (23 percent), and restricting community wind from certain districts (18 percent). Thirty-two percent of respondents said community wind was not regulated in their communities. For large wind, the five most commonly cited provisions in use by respondents' communities were permitting large wind as a conditional or special use (31 percent), setbacks (31 percent), abandonment clauses (22 percent), environmental review (22 percent), and height limits (21 percent). 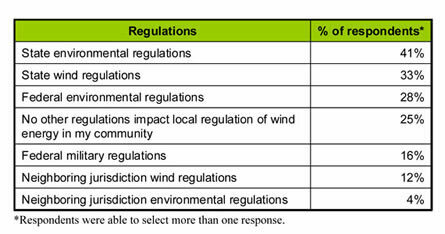 One-quarter of respondents reported that large-scale wind energy systems were not regulated in their communities. Finally, we asked about other regulations that might impact the regulation of wind energy at the local level. Although one-fourth of respondents reported that no other regulations affected local regulation of wind energy, other respondents did indicate some level of necessary intergovernmental coordination. State environmental regulations were cited by 41 percent of respondents, while 33 percent reported state wind energy regulations in effect. Federal regulations were next on the list, with 28 percent of respondents noting federal environmental regulations in play and 16 percent indicating federal military regulations. Only 12 percent of respondents noted that neighboring jurisdictions' wind regulations impacted their own, with 4 percent listing neighboring jurisdictions environmental regulations. Several respondents commented that FAA and FCC regulations also applied. We asked respondents to list how many small, community, and large-scale wind energy projects had been developed in their community. Of the 146 comments submitted, half noted at least one small-scale project, while 24 percent noted large-scale projects, and only 14 percent noted community-scale projects. Among those respondents noting small-scale wind, 78 percent counted less than 10 projects. One-third of respondents did not have any wind energy projects currently in their communities. Wind energy projects in respondents' communities ranged in size from small residential turbines to very large wind farms. Several respondents reported that the largest project in the community was a residential turbine. In terms of energy output, the largest project reported was an 800 MW, 267-turbine project. 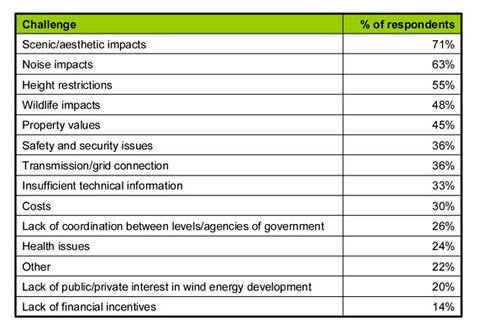 We provided a list of challenges to wind energy development, and asked respondents to tell us which they had encountered in their communities (see Table 5). The five most common challenges faced by respondents were scenic/aesthetic impacts (71 percent), noise impacts (63 percent), height restrictions (55 percent), wildlife impacts (48 percent), and property value issues (45 percent). Uncertainties in the community about wind energy. Lack of objective information on wind energy. Public concern over potential impacts, particularly noise, aesthetics, safety and shadow flicker. Prohibitive costs/lack of knowledge of financing mechanisms. Interaction of local, state and federal regulations. Ordinance does not address wind turbines. Ordinance prohibits turbines altogether, or prohibits certain types of turbines (e.g. roof-mounted systems). Ordinance contains restrictions that limit ability to install wind turbines (e.g. height limits, minimum lot sizes, setbacks). Ordinance contains one set of standards for all system sizes. We asked respondents to tell us about the policies, strategies, or actions regarding wind energy implementation that had worked well, and they provided a number of comments. In their comments, many respondents suggested having a good local ordinance that addresses wind energy, whether this meant writing a new set of regulations for wind or updating an existing wind energy ordinance. Conveying accurate, meaningful information about wind projects was also a key element of wind energy implementation. Survey takers reported that taking field trips to existing wind energy projects, inviting wind energy developers to give presentations, disseminating wind energy fact sheets, and demonstrating the financial benefits of wind turbines have aided them in implementing wind energy. Finally, keeping the public involved and fostering a cooperative relationship between residents, local government, and wind energy developers was helpful. To gather information on which issues planners think are the most pressing in the field of wind energy, we asked respondents to rank each item on a list of wind-energy related issues according to whether it was very important, somewhat important, neutral, somewhat unimportant, or very unimportant (see Table 6). When "very important" and "somewhat important" responses were added together, the most-chosen issues of importance to planners were information on small wind (82 percent), managing public concerns (82 percent), noise impacts (77 percent), scenic and aesthetic impacts (75 percent), and technical information about wind power generation and mapping of optimal wind conditions within a jurisdiction (both at 73 percent). Information on large wind was cited by 53 percent of respondents and 61 percent cited interest in information on community wind. Model ordinance language was chosen by 62 percent of respondents. A lack of accurate, non-biased information about wind energy. The need to educate the public about wind energy. Local ordinances that prohibit, limit or inadequately address wind energy. The need to understand and properly address impacts such as noise, shadow flicker, aesthetic and wildlife impacts. The need to strike the proper balance between the benefits and the potential impacts of wind energy. Difficulties planning for and regulating wind energy in the face of continual technological innovation. Finally, we asked survey respondents to suggest resources and information that would assist them in implementing wind energy projects. Their responses indicated that there is a general lack of information available on planning for and regulating wind energy. In addition to basic information about wind energy, respondents were looking for model and sample ordinance language; case studies of communities that have implemented wind energy; siting guidelines; information on potential impacts of wind turbines; hard data, particularly on wind resources, performance of wind turbines and wildlife impacts; and information on financing options. See the survey questions at www.zoomerang.com/Survey/WEB22AUTCWE3HK. APA has compiled a list of resources on aspects of wind energy implementation, from toolkits and guidelines to impacts and ordinances. American Planning Association. 2008. Planning and Zoning for Renewable Energy. Planning Advisory Service Essential Info Packet 18. Available at: https://www.planning.org/pas/infopackets/eip32.htm. • Webinar addresses how communities can encourage development of renewable energy infrastructure through plans and land use regulations. Andrews, C.J. 2008. "Energy Conversion Goes Local: Implications for Planners." Journal of the American Planning Association 74(2): 231-254. • Andrews proposes a new conceptual framework for energy planning, which he claims will allow planners to better address a multitude of issues in this area of planning. * Andriano, J.R. 2009. "The Power of Wind: Current Legal Issues in Siting for Wind Power." Planning and Environmental Law 61(5). • Article discusses the legal perspective on many wind-related issues, including writing ordinances for wind energy, enacting moratoria on wind development, and addressing aesthetic and environmental impacts. Best, A. 2010. "Transmission Boost." Planning. February. • Best discusses the implications that wind power and other alternative energy sources have for the nation's transmission grid. * Davis, A., J. Rogers and P. Frumhoff. 2008. "Putting Wind to Work." Planning. October. • Article gives a general overview of the state of wind energy in the US. Duerksen, C., et al. 2007, revised February 16, 2010. Sustainable Community Development Code. Beta Version 1.2. Section 8.1. Renewable Energy: Wind (small- and large-scale). Available at: http://law.du.edu/index.php/rmlui/program/sustainable-community-development-code-framework. • Model code presents strategies to remove obstacles, create incentives, and enact standards to encourage wind energy system development. Green, J., and M. Sagrillo. 2005. "Zoning for Distributed Wind Power – Breaking Down Barriers." National Renewable Energy Laboratory Conference Paper 500-38167. Available at: www.osti.gov/bridge/servlets/purl/15020001-sqRSMh/. • Authors address the challenges that multilevel, conflicting, or overlapping land-use regulations present for widespread implementation of distributed wind energy systems. * Heller, E. 2008. "Urban Wind Turbines." Zoning Practice. July. • An overview of some of the issues to take into account when drafting a zoning ordinance for small wind turbines. Author specifically focuses on urban communities. * Heller, E. 2008. Wind and Solar Production and the Sustainable Development Code. The Rocky Mountain Land Use Institute Sustainable Community Development Code Research Monologue Series: Energy. Denver, CO: Rocky Mountain Land Use Institute. PDF at: http://law.du.edu/images/uploads/rmlui/rmlui-sustainable-SolarWind.pdf. • Provides a summary of wind and solar energy technology. • Discusses impediments to implementation of wind and solar energy systems and how local governments and planners might overcome these obstacles. Homsy, G. 2007. "Earth, Wind, and Fire." Planning. August/September. • Discusses barriers to the development of alternative energy sources. * Merriam, D. 2009. "Regulating Backyard Wind Turbines." Vermont Journal of Environmental Law 10(2): 291-311. • Discusses ways in which local governments may need to regulate small wind energy systems. Includes sample ordinance language. Mills, A., R. Wiser and K. Porter. 2009. The Cost of Transmission for Wind Energy: A Review of Transmission Planning Studies. Ernest Orlando Lawrence Berkeley National Laboratory. Available at: http://eetd.lbl.gov/ea/emp/reports/lbnl-1471e.pdf. • Detailed report that examines 40 transmission planning studies and draws some conclusions about the costs of expanding the transmission grid to accommodate expanded wind energy development. National Wind Coordinating Committee. 2005. Technical Considerations in Siting Wind Developments. NWCC Research Meeting, December 1-2. Available at: www.nationalwind.org/assets/blog/FINAL_Proceedings.pdf. • Summarizes the proceedings at a 2005 NWCC research meeting, which focused on wind turbine siting practices and their environmental impacts. National Wind Coordinating Committee. 2005. Wind Power Facility Siting Case Studies: Community Response. Available at: www.nationalwind.org/asset.aspx?AssetId=467. • A compilation of case studies that examine the development process of nine wind energy projects. Authors pay particular attention to the level of community acceptance received by the projects, and the evolution of community perceptions during the development process. National Wind Coordinating Committee. 2009. State of the Art in Wind Siting: A Seminar. Meeting Proceedings, October 20-21. Available at: www.nationalwind.org/asset.aspx?AssetId=479. • Technical information on several topics in wind siting, including visual impacts, acoustic impacts, radar interference, property values, and icing. * American Wind Energy Association. "Small Wind Toolbox: Promote Streamlined Zoning and Permitting Procedures." Available at: www.awea.org/smallwind/toolbox/IMPROVE/zoning.asp. • Discusses zoning for small wind energy systems. Includes the AWEA model small wind ordinance, links to several ordinances, and a do's and don'ts table for developing such an ordinance. American Wind Energy Association. 2008. In the Public Interest: How and Why to Permit for Small Wind Systems. A Guide for State and Local Governments. Available at: www.awea.org/documents/InThePublicInterest.pdf. • Overview of issues related to permitting wind conversion systems within municipalities. 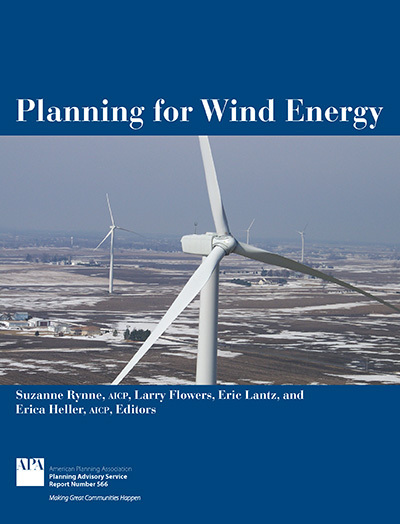 • Discusses best practices for zoning for wind systems and includes a model wind ordinance. American Wind Energy Association. 2008. Policies to Promote Small Wind Turbines: A Menu for State and Local Governments. Available at: www.awea.org/documents/Policies_to_Promote_Small_Wind_Turbines.pdf. • Presents a series of policies that local governments can use to increase the use of wind turbines in their communities. American Wind Energy Association. 2008. Wind Energy Siting Handbook. Available at: www.awea.org/sitinghandbook/download_center.html. • A guidebook for developers of large-scale wind energy projects that addresses the environmental aspects of siting. Asmus, P., et al. 2003. Permitting Small Wind Turbines: A Handbook – Learning from the California Experience. American Wind Energy Association, September. Available at: www.consumerenergycenter.org/erprebate/documents/awea_permitting_small_wind.pdf. • Handbook provides an overview of small wind energy systems; information on the installation process; permitting small wind systems under CA regulations; a model ordinance; and a resource and reference list. Environmental Law & Policy Center. 2004. Community Wind Financing. Available at: www.elpc.org/documents/WindHandbook2004.pdf. • Guidebook discusses financing mechanisms for community wind projects. Authors address debt and equity sources, federal and state programs/incentives for wind energy, tax structures and more. National Renewable Energy Laboratory. 2006. Wind Energy Guide for County Commissioners. Available at: www.nrel.gov/wind/pdfs/40403.pdf. • A guide on the development and implementation of utility-scale wind projects (greater than 600 kW), with particular emphasis on information relevant to county commissioners and other county-level officials. National Wind Coordinating Committee. 2002. Permitting of Wind Energy Facilities: A Handbook. Available at: www.nationalwind.org/assets/publications/permitting2002.pdf. • Discusses elements of the permitting process, with information on both the overall structure of the process and specific strategies. Includes several case studies. Wiedman, J. 2010. "Community Renewables: Model Program Rules." Interstate Renewable Energy Council. Available at: http://irecusa.org/wp-content/uploads/2010/11/IREC-Community-Renewables-Report-11-16-10_FINAL.pdf. • Recently drafted guidelines that address administrative and operating issues for community-owned renewable energy projects. Windustry. "Community Wind Toolbox." Available at: www.windustry.org/CommunityWindToolbox. • A comprehensive guide to planning and implementing a community wind project. Windustry. 2007. "Wind Project Calculator." Available at: www.windustry.org/your-wind-project/community-wind/community-wind-toolbox/chapter-3-project-planning-and-management/wi. • An Excel template of a pro forma to help would-be wind energy developers calculate costs and returns of specific projects. Includes links to other financial calculators. Alberts, D.J. 2006. A Primer for Addressing Wind Turbine Noise. Lawrence Technological University. Available at: www.ltu.edu/cm/attach/165D79C3-DD14-41EC-8A7F-CFA2D0C272DE/AddressingWindTurbineNoise.pdf. • Detailed examination of sound produced by wind turbines, its impact, and the various ways to regulate it. American Wind Energy Association and Canadian Wind Energy Association. 2009. Wind Turbine Sound and Health Effects: An Expert Panel Review. Available at: www.awea.org/newsroom/releases/AWEA_CanWEA_SoundWhitePaper_12-11-09.pdf. • A technical discussion of noise impacts of wind turbines. Hoen, B., et al. 2009. The Impact of Wind Power Projects on Residential Property Values in the United States: A Multi-Site Hedonic Analysis. Ernest Orlando Lawrence Berkeley National Laboratory. Environmental Energy Technologies Division. Available at: http://eetd.lbl.gov/ea/ems/reports/lbnl-2829e.pdf. • A study of the effects of wind turbines upon property values. Authors found no widespread property value impacts resulting from the presence of wind turbines. Rogers, A.L., J.F. Manwell and S.Wright. 2006. Wind Turbine Acoustic Noise. White paper. Renewable Energy Research Laboratory, University of Massachusetts at Amherst. Available at: www.ceere.org/rerl/publications/whitepapers/Wind_Turbine_Acoustic_Noise_Rev2006.pdf. • Detailed paper on the amount and nature of sound generated by wind turbines. United States Department of the Interior, Bureau of Land Management. "Wind Energy Development Programmatic EIS." Available at: http://windeis.anl.gov/index.cfm. • Materials related to the BLM's assessment of the environmental impacts of wind energy projects on BLM-owned lands in the Western United States. Wind Turbine Guidelines Advisory Committee (Federal Advisory Committee). 2010. Wind Turbine Advisory Committee Recommendations. Available at: www.fws.gov/habitatconservation/windpower/Wind_Turbine_Guidelines_Advisory_Committee_Recommendations_Secretary.pdf. • The recently updated version of the US Fish and Wildlife Service guidelines for wind energy development. Includes a section on policy recommendations as well as specific guidelines. Iowa League of Cities. 2010. Small Wind Innovation Zone Model Ordinance. Available at: www.iowaleague.org/downloads/resources/QandA/2010/SmallWindInnovationZoneModelOrdinance-FinalCommitteeVersionasof3-04-10.doc. • Recently drafted model ordinance for Iowa communities. Lawton, C. 2002. Commercial Wind Energy Facility and Wind Access Model Ordinance. Town of Barton, Washington County, Wisconsin. Available at: www.wind-watch.org/documents/wp-content/uploads/wind-energy-model-ord.doc. • Discussion of commercial wind energy facility siting ordinance issues; provides ordinance framework. Maine State Planning Office. 2009. "Model Wind Energy Facility Ordinance." Available at: www.maine.gov/spo/landuse/docs/ModelWindEnergyFacilityOrdinance.pdf. • Detailed model ordinance for wind energy facilities. Includes definitions for different types of wind energy facilities based on output. Massachusetts Division of Energy Resources and Massachusetts Executive Office of Energy and Environmental Affairs. "Model Amendment to a Zoning Ordinance or By-law: Small Wind Energy Systems." Available at: www.mass.gov/Eoca/docs/doer/renew/model-allow-wind-small.pdf. • Concise model small wind systems ordinance to provide guidance to cities and towns. Massachusetts Division of Energy Resources, State of. 2008. "Companion Document to Model Amendment to a Zoning Ordinance or By-law: Allowing Wind Facilities by Special Permit." Available at: www.mass.gov/Eoca/docs/doer/renew/allow-wind-by-permit-companion.pdf. • Includes model development standards for utility-scale and on-site projects. Minnesota, State of. 2005. "Model Wind Ordinance." Available at: www.cleanenergyresourceteams.org/files/2005_model_wind_ordinance.pdf. • Companion document available at: www.cleanenergyresourceteams.org/files/2005_model_wind_ordinance_comp.pdf. New York Energy Research & Development Authority, State of. 2005. Wind Energy Model Ordinance Options. Available at: www.powernaturally.org/programs/wind/toolkit/2_windenergymodel.pdf. • Provides samples of ordinance language for writing large wind energy system ordinances. North Carolina Wind Working Group. 2008. Model Wind Ordinance for Wind Energy Facilities in North Carolina. Available at: www.ncsc.ncsu.edu/wind/wwg/publications/NC_Model_Wind_Ordinance_June_2008_FINAL.pdf. • Model ordinance with provisions for small, medium and large wind energy facilities. Pennsylvania Department of Environmental Protection, Office of Energy and Technology Development. 2006. "Model Wind Ordinance for Local Governments." Available at: www.portal.state.pa.us/portal/server.pt/community/wind/10408. • Provides 3 model ordinances: amendments to an existing zoning code, subdivision/land development regulations for wind energy systems, and a free-standing ordinance. South Dakota Public Utilities Commission. 2008. Draft Model Ordinance for Siting of Wind Energy Systems (WES). Available at: http://puc.sd.gov/commission/twg/WindEnergyOrdinance.pdf. • Model ordinance for Large Wind Energy Systems. • Includes summary and analysis of ordinances from Illinois, Kansas, Michigan, Minnesota, New York, Pennsylvania, South Dakota, Wisconsin and Utah. US Department of Energy. Energy Efficiency & Renewable Energy. Wind Powering America. "Wind Energy Ordinances." Available at: www.windpoweringamerica.gov/policy/ordinances.asp. • A database of over 70 local wind energy ordinances from communities across the country. Unalaska (Alaska), City of. 2009. Code of Ordinances. Title 8, Chapter 18.12. Section 8.12.170(Q). Small Wind Energy System. Title 17, Chapter 17.36. Wind Energy System. Bullhead City (Arizona), City of. 2010. Municipal Code. Title 17, Zoning. Chapter 17.39. Alternative Energy Systems. Section 17.39.040. General Regulations – Vertical-Axis Systems. Coconino (Arizona), County of. 2007. Coconino County Zoning Ordinance. Section 14. Special Uses. 14.8. Accessory Wind Energy Systems. Apple Valley (California), Town of. 2010. Development Code. Chapter 9.78. Wind energy Conversion Systems (WECS). Kern (California), County. 2010. Zoning Ordinance. Chapter 19.64. Wind Energy (WE) Combining District. Lancaster (California), City of. 2010. Municipal Code. Title 17. Chapter 17.40. Article XI. Wind Energy Conversion Systems. Monterey (California), County of. 2010. Monterey County Zoning Ordinance. Title 21. Zoning. Chapter 21.64. Special Regulations. 21.64.120. Regulations for commercial and noncommercial wind energy conversion systems. Murrieta (California), City of. 2010. Municipal Code. Title 16. Development Code. 16.44. Standards for Specific Land Use. 16.44.220. Non-commercial wind energy conversion systems. Palm Springs (California), City of. 2010. Municipal Code. Title 11. Peace, Morals and Safety. Chapter 11.74. Noise Ordinance. Section 11.74.044. Wind Energy Conversion Systems (WECS). See also: Zoning Code. Chapter 94.00. Procedures. Section 94.02.00H(8). Conditional Use Permit - Commercial Wind Energy Conversion Systems. Riverside (California), County of. 2010. Riverside County Code. Title 17. Zoning. Chapter 17.224. Commercial Wind Energy Conversion Systems (WECS) Permits. See also: Chapter 17.164. W-E Wind Energy Resource Zone. Rohnert Park (California), City of. 2010. Municipal Code of Rohnert Park. Title 17. Zoning. Chapter 17.070. Land Use Footnotes/Special Provisions. (BB) Small Wind Energy Systems. San Diego (California), County of. 2010. Zoning Ordinance. Part 6. General Provisions. Section 6951. Wind Turbine System, Large. Woodland (California), City of. 2010. Code. Chapter 25. Zoning Ordinance. Article 21. Special Provisions. Section 25-21-20. Alternate Energy Sources. Avon (Connecticut), Town of. 2010. Charter, Ordinances and Selected Regulations. Appendix D. Zoning. Section IV. Residential and Rural Zones. 4. Special exceptions. (u). Small wind energy system (windmill). Port Orange (Florida), City of. 2010. Land Development Code. Chapter 16. Miscellaneous Regulations. Section 7. Renewable energy systems. Floyd (Georgia), County of. 2010. Code of Ordinances. Appendix B. Unified Land Development Code. Article 4. Restrictions Regarding Particular Uses. 4.2.13. Small wind energy systems. Jefferson (Idaho), County of. 2008. Wind Energy Ordinance. Belvidere (Illinois), City of. 2010. Code of Ordinances. Chapter 150, Article 7, Sec. 150.714 Wind Energy System Standards. Chicago (Illinois), City of. 2010. Zoning Ordinance. Section 17-17-0311-B(4). Limitations on Rooftop Features in R Districts. Schaumburg (Illinois), Village of. 2010. Village Code. Title 15. Land Usage. Chapter 154. Zoning. Special Uses. 154.90.02. Wind Energy Conversion Systems. Mason (Iowa), City of. 2010. Zoning Ordinance. Chapter 12-17. Wind Energy Conversion Systems. Hays (Kansas), City of. 2009. Code of Ordinances. Chapter 71. Zoning. Article X. Wind Energy Conversion Systems. Saline (Kansas), County of. 2009. Code. Appendix A. Zoning and Master Plan Resolution. Part 1. Zoning Resolution. Article XII. General Provisions. Section 12.12. Private wind energy conversion systems. Section 12.13. Commercial wind energy conversion systems. Topeka (Kansas), City of. 2010. Topeka Municipal Code. Title 18. Comprehensive Plan – Signs – Subdivisions – Zoning. Chapter 18.265. Wind Energy. Biddeford (Maine), City of. 2008. Revised Code of Ordinances. Part III. Land Development Regulations. Article VI. Performance Standards. Section 75. Small Wind Energy Systems. Cape Elizabeth (Maine), Town of. 2009. Chapter 19. Zoning Ordinance. • Wind energy systems referenced on a district-by-district basis. Eliot (Maine), Town of. 2010. Municipal Code of Ordinances. Chapter 45. Zoning. Article IX. Standards for Specific Activities. Sec. 45-461. Small wind energy systems. Saco (Maine), City of. 2009. Zoning Ordinance. Article 7. Standards of Performance. Section 730. Small Wind Energy Systems. Barnstable (Massachusetts), Town of. 2008. Code. Chapter 240. Zoning. Article V. Accessory Uses. Section 240-44.1. Land-based wind energy conversion facilities (WECFs). Brewster (Massachusetts), Town of. 2010. Code of the Town of Brewster, Massachusetts. Part II. General Legislation. Chapter 179. Zoning. Article IX. Special Regulations. 179-40.2. Wind energy turbines. Gloucester (Massachusetts), City of. 2008. Zoning Ordinance. Section II. Use Regulations. Table 2.3.7. Accessory Uses. Section 5.23. Residential Land-Based Wind Energy Conversion Facilities. Scituate (Massachusetts), Town of. 2010. Zoning Bylaws. Section 740. Wind Energy Conversion System. Worcester (Massachusetts), City of. 2010. Zoning Ordinance. Article IV. Use Regulations. Section 13. Wind Energy Conversion Facilities. Grand Haven (Michigan), Charter Township of. 2009. Code of Ordinances. 15.0000. Zoning. 15.1900. Special Land Uses. 47. Medium Wind Energy Conversion Turbines. Grand Rapids (Michigan), City of. 2009. City Code. Title V. Zoning and Planning. Chapter 61. Zoning Ordinances. Article 11. Landscaping and Environmental Protections. Section 5.11.14. Alternative Energy. Huron (Michigan), County of. 2009. Zoning Ordinance of Huron County. Article X. Huron County Wind Energy Conversion Facility Overlay Zoning. Laketown (Michigan), Township of. 2010. Code of Ordinances. Chapter 38. Zoning. Article IX. Wind Energy Conversion Systems. Norton Shores (Michigan), City of. 2010. Code of Ordinances. Chapter 48. Zoning. Article XIV. Wind Turbines and Wind Energy Facilities. Thomas (Michigan), Township of. 2010. Code of Thomas Township. Title 10. Zoning. Chapter 2. General Requirements. Section 10-2-2(R). Supplementary Regulations – Wind Energy System. Troy (Michigan), City of. 2008. Zoning Ordinance. Section 32.40.00. Wind Systems and Associated Structures. Walker (Michigan), City of. 2010. Code of Ordinances. Chapter 94, Zoning. Article XIX. Sustainable Energy. Brainerd (Minnesota), City of. 2009. Zoning Ordinance. Section 512-34. Wind Energy Conversion Systems (WECS). Chippewa (Minnesota), County of. 2005. Zoning Ordinance. Section 12. Windpower Management. Fairmont (Minnesota), City of. 2008. Code of City of Fairmont, Minnesota. Chapter 26. Zoning. Article V. Special Development Regulations. Division 5. Wind Energy Conversion Systems. Minneapolis (Minnesota), City of. 2010. Minneapolis Code of Ordinances. Title 20. Zoning Code. Chapter 535. Regulations of General Applicability. Article X. Wind Energy Conversion Systems. Windustry. "County Wind Ordinance Survey." Available at: www.windustry.org/county-wind-ordinance-survey. • Clearinghouse of wind ordinances from Minnesota counties. Gladstone (Missouri), City of. 2009. Code of Ordinances. Title VII. Zoning and Planning Ordinance (ZAPO). Chapter 167. Alternative Energy Systems. North Kansas City (Missouri), City of. 2010. Code of North Kansas City. Title 17. Zoning. Chapter 17.88. Accessory Uses. 17.88.140. Wind energy conversion systems. Lincoln (Nebraska), City of. Lincoln Municipal Code Book. Title 27. Zoning. Chapter 27.63. Special Permits. Section 27.63.420. Permitted Special Use: Wind Energy Conversion Systems (WECS) Over the District Height. Madison (Nebraska), County of. 2010. "Wind Energy Conversion Facilities: Madison County Addition to Current Zoning Regulations." Las Vegas (Nevada), City of. 2010. Zoning and Subdivision Laws. Title 19. Zoning Code. 19.04. Permissible Uses. Table 2 – Land Use Table, Utilities, Communications & Transportation. Small Wind Energy Systems. Conway (New Hampshire), Town of. 2009. Chapter 147-A, Small Wind Energy Systems Ordinance. Henderson (New York), Town of. 2007. Town Laws. Chapter 150. Zoning. Article IX. Wind Generation Facilities. Lebanon (New York), Town of. 2004. WindPower Facility Application and Regulations. • New York Energy Research & Development Authority, State of. 2004. Examples of NY Local Governmental Laws/Zoning Provisions on Wind. Wautaga (North Carolina), County of. 2006. Ordinance to Regulate Wind Energy Systems. Bismark (North Dakota), City of. Code of Ordinances. Title 14. Zoning. Chapter 14-03. Districts: Uses. 14-03-08. Special Uses. 4. Permanent Uses. v. Small Wind Energy Systems. Wells (North Dakota), County of. 2009. Wells County Zoning Ordinance (WCZO). Article 12 – Wind Energy Facilities. Cleveland (Ohio), City of. 2009. Zoning Code Update. Chapter 354A – Wind Energy Facilities. Effective June 12, 2009. Oklahoma City (Oklahoma), City of. 2010. Municipal Code. Chapter 59. Zoning and Planning Code. Article XII. Site Development Standards. Section 59-12200. Standards for accessory buildings, structures and uses. 12200.3(F). Private Wind Energy Conversion System. Yukon (Oklahoma), City of. 2008. Code of Ordinances. Part II. Code of Ordinances. Chapter 18. Buildings and Building Regulations. Article VII. Wind Energy Conversion Systems. Lincoln City (Oregon), City of. 2009. Lincoln City Municipal Code. Title 17. Zoning. Chapter 17.80. Provisions Applying to Special Uses. 17.80.090. Small wind energy systems. Erie (Pennsylvania), City of. 2010. Ordinance 02-2010. Wind Energy. Rapid City (South Dakota), City of. 2010. Code of Ordinances. Title 17. Zoning. Chapter 17.50. Supplementary Regulations. Article II. Accessory Uses. Section 17.50.215. Wind energy conversion systems. Section 17.50.217. Vertical axis wind turbines. McKinney (Texas), City of. 2010. Code of Ordinances. Chapter 146. Zoning Regulations. Article IV. Special Regulations. Section 146-140. Wind energy conversion system (WECS) regulations. Rockport (Texas), City of. 2009. Code of Ordinances. Chapter 42. Environment. Article VI. Wind Powered Systems. Weatherford (Texas), City of. 2010. Code of Ordinances. Title XII. Zoning Ordinance. Article V. Development Standards. Section 44. Supplemental regulations. 44.55. Wind energy systems. Eagle Mountain (Utah), City of. 2010. Eagle Mountain Municipal Code. Title 17. Zoning. Chapter 17.76. Small Wind and Solar Energy Conversion Systems. Weber (Utah) County of. 2008. Planning Staff Report: Zoning Petition #15-07 To Amend the Weber County Zoning Ordinance by Adding Small Wind Turbines as a Conditional Use in the RE-20 Zone. January 8. Suffolk (Virginia), City of. 2010. Unified Development Ordinance. Article 7. Supplemental Use Regulations. Section 31-722. Wind Energy. Kittitas (Washington), County of. 2010. Kittitas County Code. Title 17. Zoning. 17.61A. Wind Farm Resource Overlay Zone. 17.61B. Small Wind Energy Systems. Also see: "Draft, NEW Section 17.61C, Community Wind Energy Systems." Antigo (Wisconsin), City of. 2010. Code of Ordinances. Chapter 14. Land Use Regulations. Article II. Zoning. Division 5. Subsection VII. Section 14-892. Wind Energy Systems. Fontana-on-Geneva Lake (Wisconsin), Village of. 2010. Municipal Code. Chapter 79. Energy Systems. Article II. Wind Energy Systems Licensing Ordinance. River Falls (Wisconsin), City of. 2010. Municipal Code. Title 17. Zoning. Chapter 17.108. Extraterritorial Zoning. Section 17.108.230. Small Wind Electrical Generation Towers. Sawyer (Wisconsin), County of. 2007. Sawyer County Wind Energy System Ordinance. Shawano (Wisconsin), County of. 2005. Wind Energy Conversion System Ordinance. Douglas (Wyoming), City of. 2010. Code of Ordinances. Title 18. Zoning. Chapter 18.73. Accessory Wind Energy Systems. American Wind Energy Association. Available at: www.awea.org/. • Nonprofit organization that promotes and advocates for wind energy development across the U.S. Website has extensive resources on various aspects of wind energy. Database of State Incentives for Renewables and Efficiency (DSIRE). 2010. Available at: www.dsireusa.org/. • Extensive database of local, state and federal incentives and policies for renewable energy, organized on a state-by-state basis. Interstate Renewable Energy Council. 2007. "Small Wind Energy." Available at: www.irecusa.org/irec-programs/small-wind-energy/. • A clearinghouse of small wind news. National Renewable Energy Laboratory. "Wind Research." www.nrel.gov/wind/. • NREL specializes in research and development related to alternative energy and energy efficiency. The "Wind Research" page provides links to NREL's work on wind energy. National Wind Coordinating Collaborative. Available at: www.nationalwind.org. • NWCC brings together wind energy stakeholders from many sectors to pursue the shared goal of promoting the US market for commercial wind energy. NWCC's website contains many resources and reports on issues affecting this goal, with particular emphasis on transmission, wildlife and siting concerns. Salkin, Patty. 2010. "Law of the Land: A Blog on Land Use and Zoning." Archive for the "Wind Development" category. Available at: http://lawoftheland.wordpress.com/category/wind-development/. • This portion of Salkin's blog provides commentary on and links to recent legal cases related to wind energy development. United States Department of Energy. "Wind." Available at: www.energy.gov/energysources/wind.htm. • This webpage contains links to the DOE's wind energy programs and research efforts. United States Department of Energy. "Wind Powering America." Available at: www.windpoweringamerica.gov/. • Wind Powering America is a Department of Energy initiative to substantially increase the production and use of wind energy in the US. The website contains information on Wind Powering America's varied program areas, as well as additional resources on wind energy. United States Department of Energy. Energy Efficiency and Renewable Energy. "Wind & Water Power Program." Available at: http://www1.eere.energy.gov/windandhydro/index.html. • Website for the DOE's Office of Energy Efficiency and Renewable Energy, which researches and invests in renewable energy. This page contains information on the wind and water power program. • Windustry is a nonprofit dedicated to promoting community-developed and -owned wind energy projects. The Windustry website provides a clearinghouse of information on community wind.